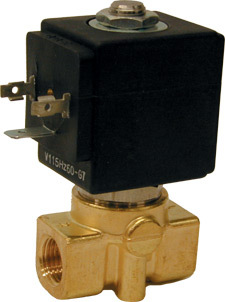 SVM3300 Series 2-way solenoid valves are direct-acting, normally closed or normally open valves featuring a brass body with stainless steel parts and FKM seal material. The fluid temperature range is -10 to +140°C. They are ideal for neutral media such as compressed air, inert gases, water, and synthetic oils. Operating coils are ordered separately and available for 12 Vdc, 24 Vdc, 24 Vac, 115 Vac and 230 Vac.